Giovanni Belzoni and Alessandro Ricci’s watercolours of the tomb of Seti I are all we have to support Belzoni’s claims of the beauty and freshness of the pharaoh’s tomb in the Valley of the Kings when it was ‘discovered’ in October 1817. When the Italian strongman-turned-archaeologist entered into the main chambers after crawling through rubble and dusty mummified remains he reported that the colour and relief was as vivid as the day it was painted. 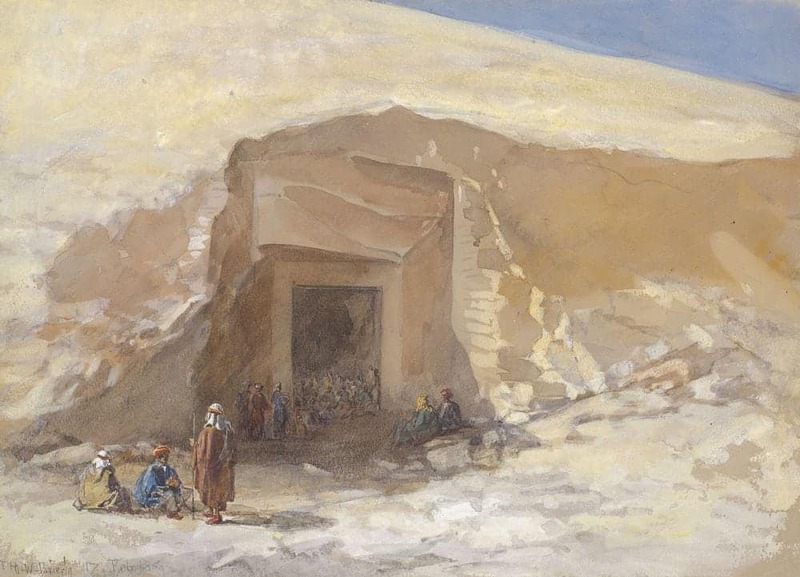 Thebes, Tombs of the Kings: Entrance to Belzoni's Tomb, 17th February 1869, Oswald Walters Brierly. Within a few years the tomb was a ghost of its former glory. Sections of the polychrome decoration were removed and taken to the great European capital cities. The sarcophagus was sold to Sir John Soane in 1824. Belzoni wanted to recreate the tomb in Europe, so he decided to make casts of the walls in wax, which would accurately record the surface but would pull off the colour in the process. He knew he was going to destroy the decoration - but also realised that he would need a good colour reference to make a commercially successful copy. So before they started casting, he and his assistant Ricci made their watercolours. 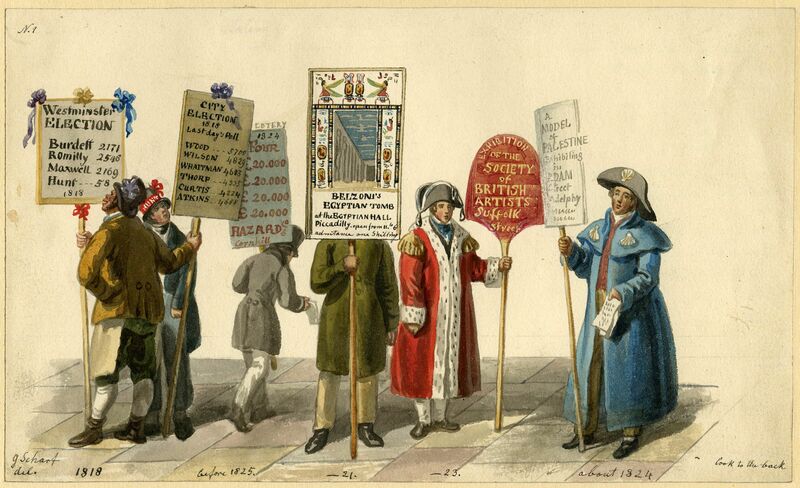 Belzoni’s replica opened in the Egyptian Hall in London in 1821 to great public acclaim. He may have seriously damaged the original, but he made his reputation – and good money – in the process. Soon after, however, he died after contracting dysentery on his way to the Kingdom of Benin. Nearly two centuries later, Seti’s tomb was being reconstructed again. I became involved in around the year 2000, when it became clear that the technology existed to make a forensically accurate copy as part of wider conservation efforts. This time, Factum Foundation were able to replicate the original without touching the original. Instead of wax and paint we used advanced, non-contact digital scanners and photographic equipment. But to recreate the colours as they originally appeared in the Hall of Beauties, all we had were Belzoni's watercolours. Without records memories fade fast. Today, we have extraordinary tools at our disposal. We can use advanced photographic methods to record the world as we see it in colour and 3D. We can view the results on screen or augmented, virtual and mixed reality devices. Objects can be re-materialised, using digital recordings to create physical replicas of extraordinary faithfulness. But we can’t reconstruct the past without access to the historical records. The watercolours Belzoni and Ricci are not great works of art but they serve a great function: they let us to understand how the tomb has changed and what has been lost. To many people, watercolours don’t look like much, but if you look at them in a different way they become truly amazing. They are changing our knowledge of the past and shaping the future, and they deserve to be conserved every bit as urgently as the tombs and monuments they so often depict. Adam Lowe is the director of Factum Arte and Factum Foundation.